I’ll begin with a little background. Since the country of Israel was established in 1948, all trivets labeled “Made In Israel” have been manufactured since that date. 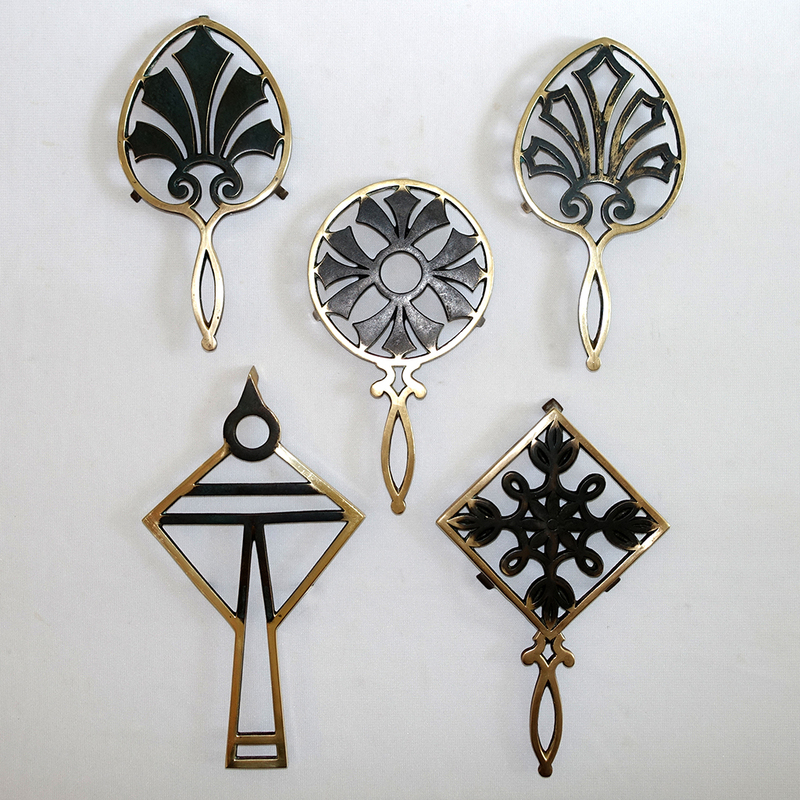 Israeli trivets come in a variety of designs, most of which were either enameled and/or treated to look like aged brass. Check the reverse for a signature identifying the maker. Maurice Ascalon of Pal-Bell of Tel-Aviv, Israel (in business 1939-1956) developed a process of treating raw brass and bronze with chemicals to produce a green patina similar to aged verdigris. The style became synonymous with mid 20th century Israeli metalware. 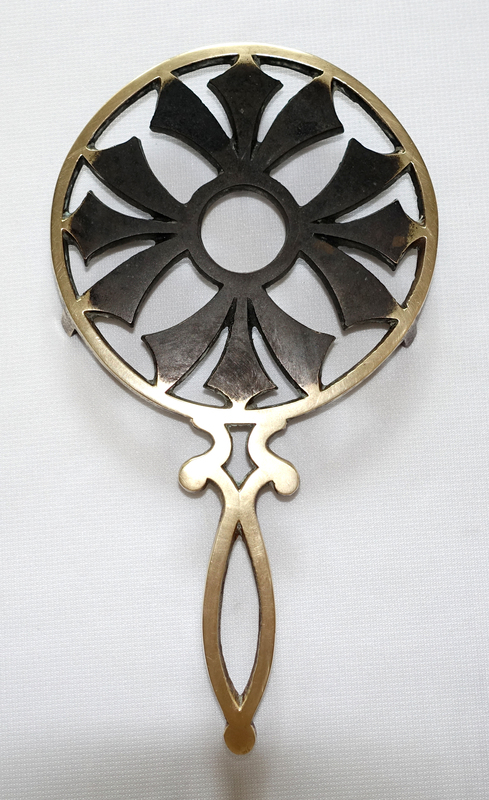 This technique was adopted by other metal crafting workshops in Israel, most notably the Dayagi Brothers of Bat-Yam in the early 1950s to early 1960s, and the Nordia moshav (co-operative village) in the 1950s. These companies also produced beautiful jugs, plates and bowls, wall hangings, ashtrays, desk writing sets, bookends and Hanukkah lamps. Over the last year I’ve been collecting Pal-Bell trivets. 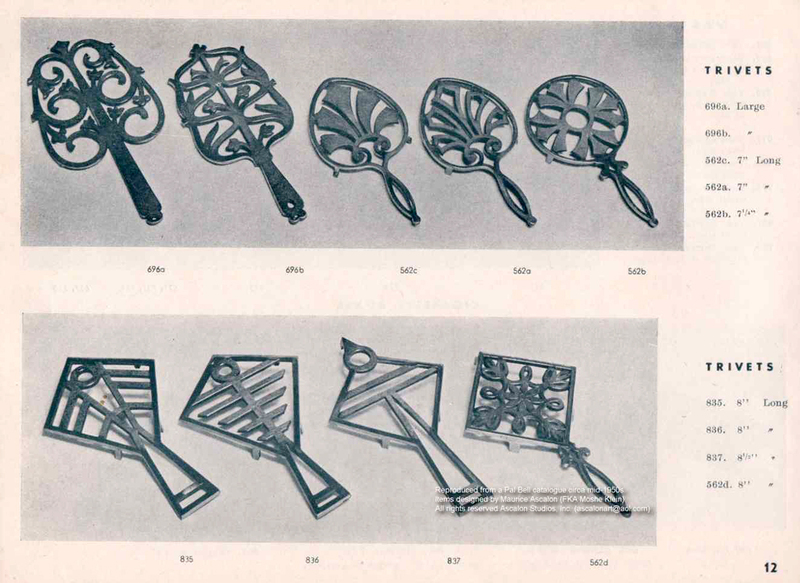 My goal is to obtain all nine of the Ascalon-designed trivets pictured on this catalog page; until today I only had four. I check the internet regularly for Pal-Bell trivets and was excited to find a 5th design on Etsy last week! I received it in the mail today; it measures 7 1/4″ x 4″ with 3 small feet. Note the monotone dark finish due to overall heavy tarnish. From studying these trivets I’d expect the handle and circular rim to be polished brass and the central design to show the traditional simulated aged verdigris patina. Taking a deep breath, I decided to attempt to restore the finish to its original condition. I proceeded carefully because I didn’t want to remove the intentional green patina, which adds character. First, I washed the trivet with soap and water, then dried it. Using some Brasso on a soft cloth, I gently buffed the front handle and rim. After 15 minutes of polishing only 50% of the tarnish had come off. Then I took my finger and gently applied Brasso ONLY to the areas where I wanted to lift any remaining tarnish- specifically the handle and rim. After letting it sit for about 5 minuted, I buffed the front handle and rim again. Much better! 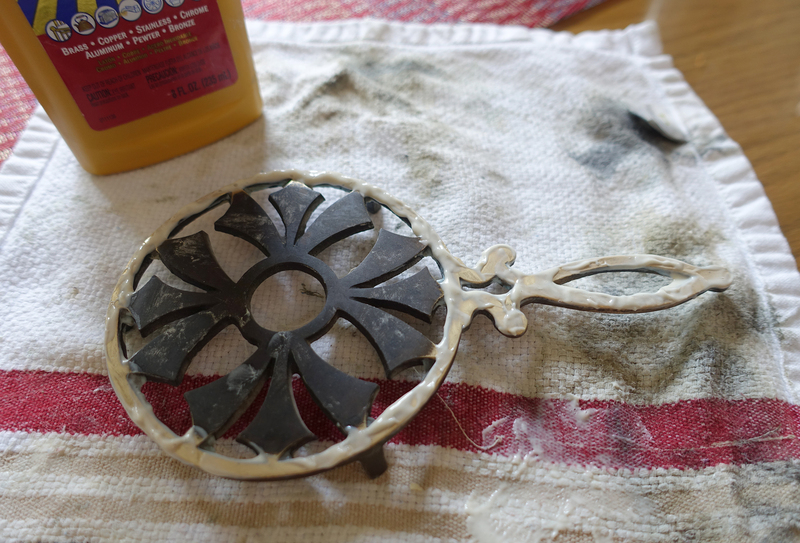 Satisfied with the results, I washed and dried the trivet, this time to remove any traces of polish that might etch the center’s green finish. The final step was to apply a light coat of Pledge furniture polish. 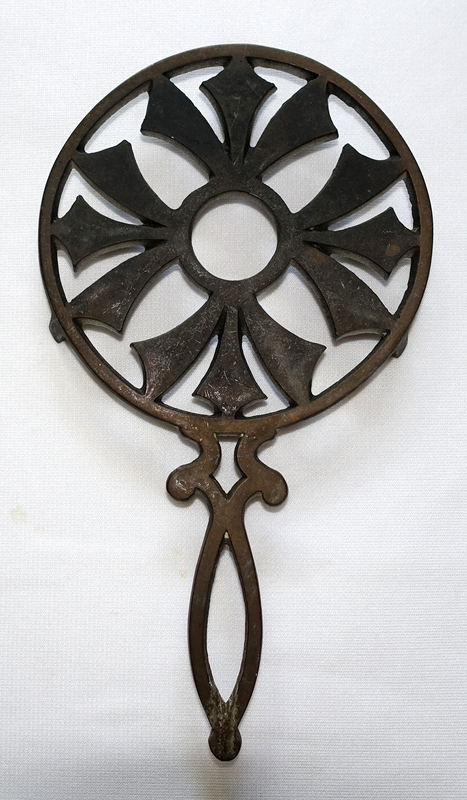 (There was little care information online, but what I found suggested simply dusting these trivets and occasionally wiping with a bit of furniture polish.) And here’s the final result! It’s ready to add to my wall display. For more information on Israeli metalware I recommend the reference book Modern Creations from an Ancient Land: Metal Craft and Design in the First Two Decades of Israel’s Independence (2006) by Nurith Kenaan-Kedar. It’s out of print with limited availability, but well worth the effort to find. So far I’ve found these five different Pal-Bell trivets. Each was dirty and tarnished when first purchased, so I followed the above process on each. From now on they will require only regular dusting and an occasional light buffing with a good quality furniture polish. This entry was posted on March 23, 2016 by Lynn Rosack in Collecting Basics, Vintage Trivets & Stands and tagged brass, Maurice Ascalon, Pal-Bell, verdigris.